Make sure to also check out the 2018 and 2019 lists of the most popular shoes and brands. With the size of the US sneaker market sitting at $17.2 billion and the resale market alone touching $1 billion, it is no wonder that shoe companies sign NBA players to multi-million dollar deals to use their feet as walking billboards. With so much money at stake, we set out to look at which shoes get the most exposure on a nightly basis. Using the Baller Shoes DB dataset, we determined the primary shoe for each player and took a closer look at the most popular shoes and brands in the NBA. The most popular shoe, by a large margin, is the Nike Hyperdunk 2016. Released on June 27, 2016, this incarnation of the shoe is the ninth Hyperdunk to hit the market. While the Hyperdunk 2015 was considered a “miss” by some, this year’s model clearly has gained the attention of NBA players, with 43 players, or almost 10% of the league wearing this shoe, including stars such as Karl-Anthony Towns, Kevin Love and Zach LaVine. While this number is impressive, it is a marked drop from the numbers posted by past Hyperdunk models, such as the Hyperdunk 2013, which was worn by 80 players. The next shoe on our list, the Nike Kobe 11, sits in an impressive second place given that its namesake no longer plays in the NBA. If you consider that the Nike Kobe AD is worn by 17 players, we see that there are almost 50 players wearing a shoe from the line of the now retired all-star. Worn by stars such as Isaiah Thomas and John Wall, the shoes remains popular among NBA players despite being released over a year ago. Rounding out the top three is the Adidas Crazylight Boost 2016. The shoe with a mouthful for a name is considered the “ultimate low top” and is worn by 17 players, including Raptors’ guard Kyle Lowry. Given that it is only in its third year, it has clearly made rapid strides in capturing the attention of players who have decided to forego the classic basketball high top. In fourth place is the first signature shoe worn by an active player, the Nike KD 9. Released on June 20, 2016, this shoe received a speedy uptake by the league, with 17 players wearing the shoe as of February 1, 2017. 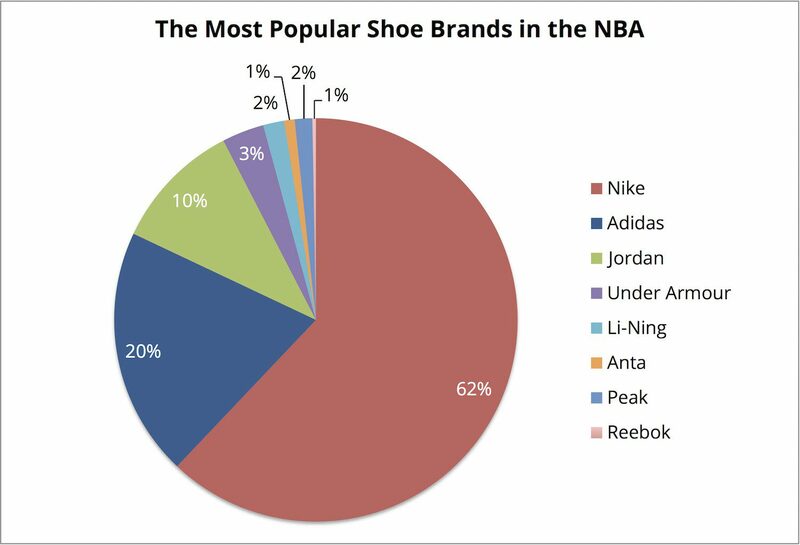 When it comes to shoe brands, Nike remains the dominant player in the industry with 62% of the NBA player market share. When combined with its subsidiary brand, Jordan, Nike controls almost three-quarters of NBA player shoe contracts. 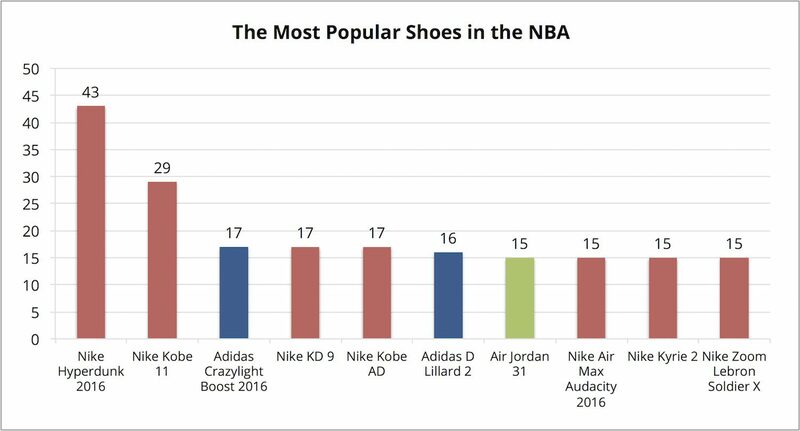 Adidas remains a distant second, at 20% of the market. In recent years, many thought Adidas was on a path to compete more seriously with Nike but the company has shown no growth in player contracts as it remains at the same 71 players it had under contract in 2013. The smaller brands that are trying to grow show how difficult it can be to gain market penetration in an industry that is dominated by a single company. Under Armour has one big name under contract – Steph Curry – but is still worn by only 12 total players, none of whom besides Curry have any real brand name recognition. Chinese companies such as Li-Ning (Dwyane Wade), Anta (Klay Thompson and Rajon Rondo) and Peak (Tony Parker and Dwight Howard) have had moderate success attracting big name players with signature shoe deals but have otherwise made virtually no inroads in the North American market. Finally, there is Reebok. The company was once a powerhouse in the industry, with names like Shaq and Iverson representing their brand. However, the shoe giant has been on a steady decline and only has two athletes currently wearing its shoes, the aging Jason Terry and injured Ramon Sessions. When Terry retires and Sessions’ contract expires, Reebok may be left without a single NBA player wearing its sneakers.